Have them make a dish. One of theses ingredient will be weird or just doesn't go with the other. Have semi famous food critics critique the food. "chop" the chef that can't make something good with the ingredients. Repeat until only one chef is left. This is how it really goes over. Have snarky self obsessed critics berate and belittle them unmercifully when they can't make something absolutely awesome using a crappy combinations of ingredients in a ridiculously short amount of time. Film the loser as he/she leaves the building practically in tears. Sometime in 1996 we acquired Penny from Marjorie. Before that she had lived with Karen, and prior to that with Kathleen in California. At one point there was a website catscan.com. 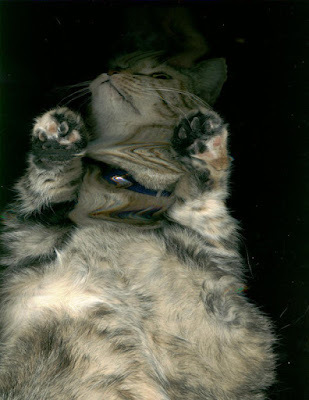 where you would put your cat on a scanner and scan them, then upload the picture. Here is Penny's catscan. Shortly after we got her she began to gain weight, so fast in fact we thought she had gotten pregnant even though Karen insisted she had been fixed. Turns out she was just eating a lot. I put her on a diet and she was only allowed to eat about 3/4 to 1 cup of food a day but did not loose an ounce of weight, even on cat diet food. At her heaviest she weighed about 15 pounds. One of the surprising things she did was beg to be petted. Here is a video of her doing this. She was still doing this up until about a week ago. She would often wake Kathi up to be fed, even though I was the one who fed her. She loved to sit on my chest and rub the back of her head on my chin. Her favorite food of all time was crab legs. Here she is pestering Kathi for some. About a year or so ago she started loosing weight. in the space of a few months she lost almost 10 pounds. she also became real picky about her food. so much so that we had to buy her canned cat food to get her to eat. Here she is partaking in one of her favorite activities "rolling in the dirt". As you can probably tell she is very skinny in this picture. She loved to be outside. When ever we let her outside she would roll in the dirt, eat grass and sit either under our plum tree or under our grape vines. Now she rests forever in one of her favorite spots. This morning Kathi and I took her to the vet to be put down. Over the last several weeks she had been getting worse. She was barely eating, and could not even jump up on the couch to sit on my chest. It was so bad that sometimes the only way I could get her to eat was to chew my food and give it to her. Last Saturday 6-21-09 was the last time she ate anything. A kingly meal for a cat. Kathi was having crab legs again and giving penny all she could eat. She must have ate at least a half a cup. J.C. got a goopy eye last week. We cleared it up with eye drops. Sometime after that Penny got the same, but in her case she was having trouble breathing, wouldn't eat, and was barely drinking water. this morning we took her in to be put down, we thought it was best as we suspected she had a broken tooth and other problems. The vet confirmed that she had a respiratory infection, at least one broken and abscessed tooth, and a lump on her thyroid (the reason for her weight problems). They gave her a sedative with some pain killers in it, she slowly fell asleep with Kathi and I comforting her, and then they gave her the injection to stop her heart. She went quickly, we wrapped her in one of my old t-shirts and took her home for proper burial. She will be greatly missed. I was informed of a really good Mexican restaurant near my house "Asi es la Vida" (This is the Life). I had been trying to have lunch there all last week but was too busy. Today I happened to go by there at lunch time, but noticed they were changing the sign. Seems they are under new ownership (oh well I will try it anyways). The interior of the restaurant is very brightly painted. However all the tables were set like you might find in a high end restaurant. I was presented with a menu by one of the servers who seemed surprised to see me there. I was asked if I wanted Chips and Guacamole (you bet I do), and a drink (Pepsi). There was not a lot of people there, a Doctor waiting on some other people, and a couple came in later. My appetizer arrived and it was a nice mound of guacamole with the chips embedded in it, in a ring. I was also presented with 3 small bowls containing Pico De Gallo, a red chili sauce, and a green sauce (possibly a tomatillo sauce). The Guacamole and chips were very good, with just a little too much onion. The 3 sauces were all quite good (hot but not too hot). I order as my entree the Adobada described as "Fillet of Pork tenderloin with Guajillo Peppers and garlic, served with Chilaquiles, beans and rice". I got mine sans beans. While I waited, my drink was refreshed without my prompting (which is good). When my meal arrived I was surprised as most Adobada I have had consists of chunks of slow cooked pork served in a spicy but not overly spiced red sauce (lots of red sauce). This was a thin grilled (tender) tenderloin medallion with a thin coating of the Guajillo pepper and garlic sauce. The rice looked like what you would get from a Japanese restaurant. I had never had Chilaquiles so I started with that first. The sauce was quite good and not overly spiced everything was piping hot. The rice while not colored red like most Mexican rice was really good and spicy (even with carrots, corn, and green beans in it). The vegetables in the rice were very well cooked. Finally I tried the Adobada. Wow this was really good. It kind of caught me off guard and so I looked in the direction of the severs and one came over to see what was wrong. I had to inform them that nothing was wrong it was just that the food was really good. I finished up and got my bill. They neglect to inform you that the chips and guacamole is extra, but no matter at $3.95 it was well worth it. The Adobada was $10.00 and I did not catch the price of the drink. No matter. I highly recommend this restaurant. While this is not the Mexican food I am used to (the Americanized stuff) it is more authentic then you will find in most restaurants in Phoenix. Check it out. Three Wolf Moon Tshirt - The Song!